Today was Day #6 of Chocolate and Pistachio Theme Week. 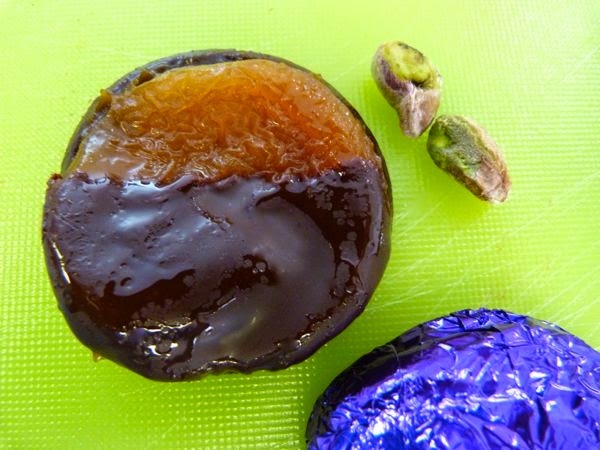 It made my mouth water to hear Her Coconess (Shelley Seward) describe these plump sweet Blenheim apricots, half-covered in dark chocolate with a layer of homemade caramel. 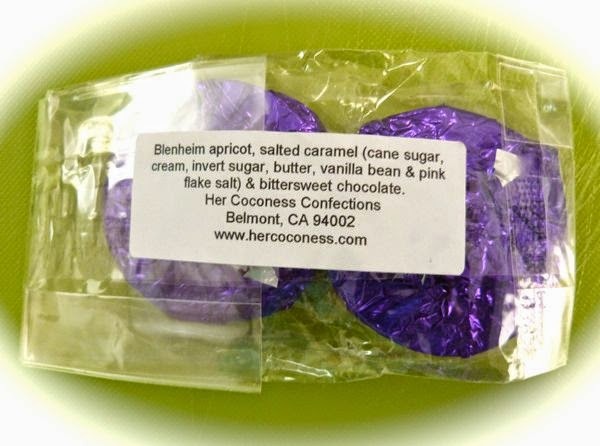 I ran into her at the Palo Alto Farmers Market a few days ago, and picked up a few items from the Her Coconess Confections (Belmont, CA) table/booth. And these generous apricot confections did not disappoint. Visually attractive, each piece was enveloped in purple foil and yielded tart, fresh apricot flavor. The vanilla salted caramel and bittersweet chocolate balanced the sweet apricot fruit flavor. A handful of pistachios and salted mixed nuts provided complementary flavor (salt, protein) and crunchy texture. Pistachios (and most nuts) do pair well with fruits and chocolate.